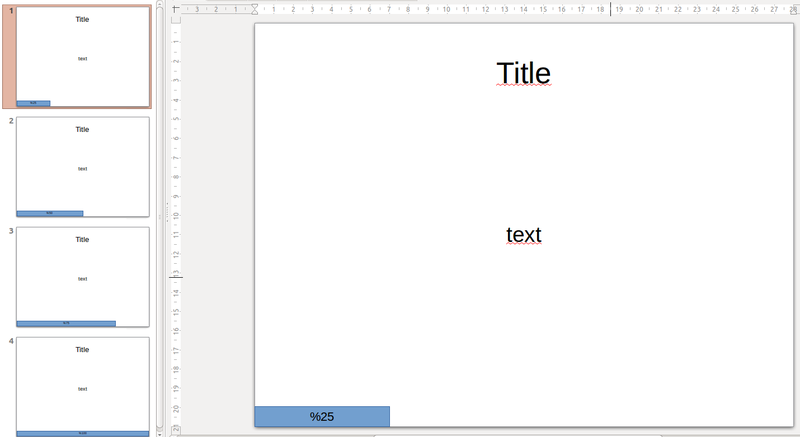 The script adds a bar with the percentage and width proportional to the position of the slide in the presentation.
' RectangleShape.String = "" + oDrawPage.Number + " / " + Doc.DrawPages.Count + " (%" + Percent + ")"
You can copy the code above or download the .bas file BAS library from my github repo here. Edit: Thanks to Leo Barichello we have now a dialog box and some customization options. 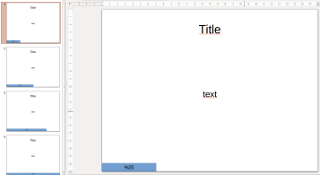 1st make a backup of your FINISHED presentation. 2nd execute the macro and a progress bar will be added to each slide, on top of whatever there is in it. Use it freely but at you own risk, I wont be responsible for any loss or damage to your work or system. 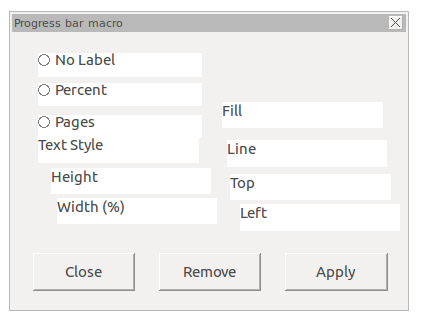 Info on how to add/import a macro to your Open Office / Libre Office Suite is available on the net, so just use your favorite search engine to find how to do it. Thank you, it was very useful! If I find some spare time, I may work in the dialog box.